Vitamin C is an essential nutrient that everybody needs on a daily basis. Zespri kiwifruit is a rich in vitamin C and is one of the best sources among fruit and vegetables – Zespri SunGold kiwifruit contains more than three times the amount of vitamin C found in oranges! Just one Zespri kiwifruit a day provides you with your daily requirement. Keeping colds away by helping to keep the immune system strong. Giving you the vitality you need to get through the day by reducing tiredness and fatigue. Increasing collagen formation, which is essential for healthy skin, teeth and bones. 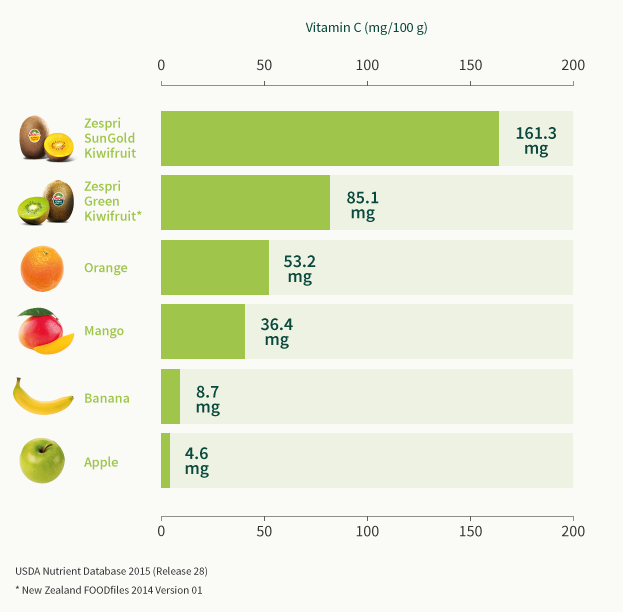 In Europe, the current recommended daily reference intake (RI) for vitamin C is 80 mg a day. One Zespri Green kiwifruit provides you with 85.1 mg of vitamin C, while one Zespri SunGold kiwifruit provides you with 161.3 mg of vitamin C – more than twice the RI! The vitamin C also helps your body produce collagen, an important protein in the skin that forms the basis for cells, which are the building blocks of the skin. Production of collagen decreases as we age, causing skin to lose elasticity. Getting enough vitamin C is important in keeping your skin healthy and improving collagen formation. Vitamin C also acts as a powerful antioxidant. Antioxidants help defend the body’s cells against oxidative damage by substances called free radicals, which damage cells and DNA. Each time you convert food into energy, free radicals are formed. They can also enter your body from the outside world via exposure to UV light (sunlight), pollution and cigarette smoke. The vitamin C can help neutralise these free radicals, reducing the extent of cell damage.